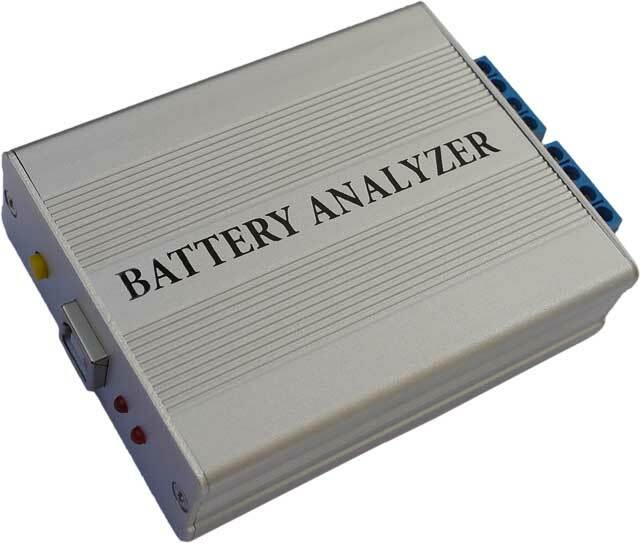 Battery Capacity Analyzer/Tester « Handheld Scientific, Inc.
To control the discharge of a battery to accurately measure its capacity and quality. USB HID class device. Uses Windows built-in driver so no additional driver installation is needed. For Windows XP/7/8. 32-bit or 64-bit. Microsoft .NET framework 3.5 required. 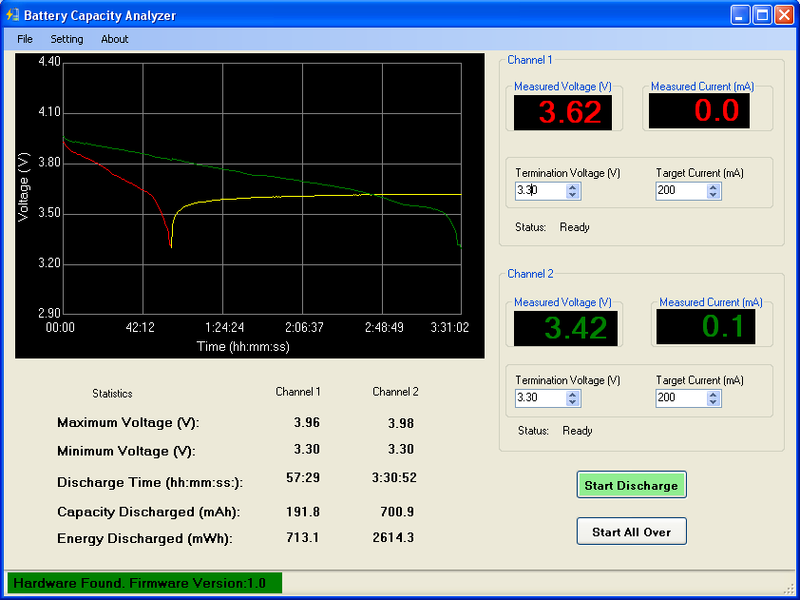 This is a sample discharge curve of two batteries claimed to be 1100 mAh. 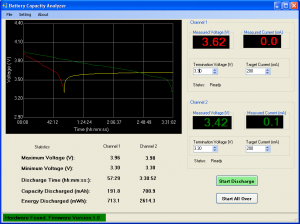 Both were charged to maximum voltage of about 4.05V before discharging. The termination voltage was set to 3.3V. The red one was really of very low quality. It only discharged 191 mAh when reaching termination voltage. The discharge current was shut off at that point. It was interesting to see that the voltage crept up after termination (the yellow curve) so voltage alone is not a good indicator of battery capacity/quality. The green one is much better. It discharged 700 mAh before reaching termination voltage which is only 64% of the claimed capacity. 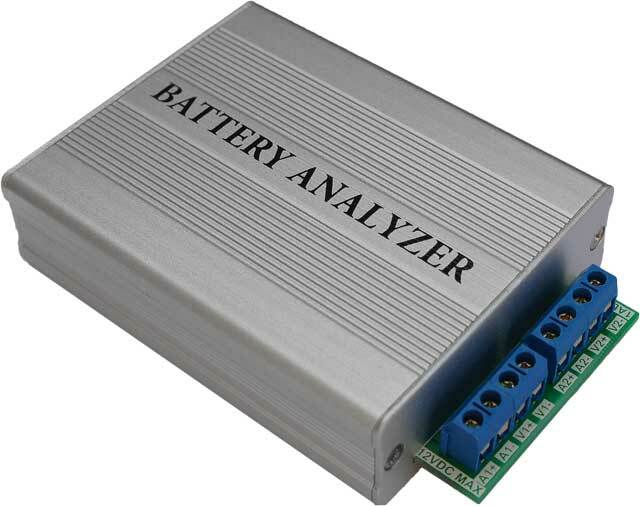 Battery capacity also depends on how many times the battery has been charged/discharged and the quality of the charger. It is strongly suggested that you download and run the software to make sure it works on your system before placing an order. Ship in 2 business days. Shipping and Handling fee: $6 flat rate to USA addresses via USPS Priority Mail or $14 to international addresses via USPS airmail. Major credit cards accepted via PayPal.